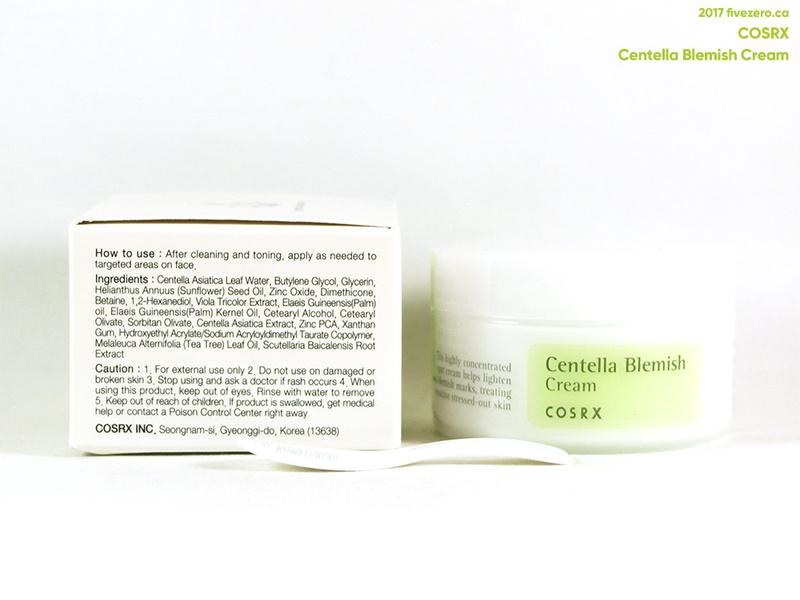 I’ll just jump straight into it: COSRX Centella Blemish Cream is pretty awesome stuff for zits. I mostly get hormonal acne, and when these appear along my jawline or in the middle of my cheek, they’re the furious kind. This cream works best for me on zits that have been popped (yeah, well…) or are in the healing process—the blemishes practically flatten and lose their redness overnight. A side effect is that this cream is also a bit drying, though I’ll obviously take a dry patch over an angry bump, any day! Still, this means that I only use it as a spot treatment. In any case, it doesn’t really prevent zits for me, so I wouldn’t personally use it as an all-over cream. It comes with a little plastic spatula, which I don’t find to be all that useful since I never use very much of this at once. One little dip of a clean fingertip gets more than enough for one use. It is a fast-acting spot treatment cream. Zinc Oxide and Centella Asiatica Leaf Water help healing of blemishes and breakouts. Use it with Centella Blemish Ampule to form a better synergy. HOW TO USE: Take a proper amount of the cream and apply a thick layer on the troubled, blemished spots. The cream itself is white, with a slightly whipped texture that differentiates it from a thick, heavy diaper cream. It is easy to apply and has a gentle, herbaceous scent. I’d prefer that it came in a squeeze tube instead of in a tub, for hygienic reasons, though. My husband already thinks the stuff is magical when he tried it on a rare zit and it almost disappeared the next morning, so I’m thinking of buying a second tub just for him. I layer it on right after washing my face at night. You can use it during the day, as well, though you may want to use a bit less since it does leave a white cast due to zinc oxide. The white cast is about what you’d expect from a mineral-based sunscreen, and not too bad. Zinc oxide is the same active ingredient in some physical sunscreens, as well as many diaper creams (Sudocrem was a godsend for Peanut when he was in diapers; Olive seems to not have a problem with diaper rash, for some reason that I will not question!). I have not tried applying diaper cream to any zits, and I’d be leery of the other ingredients it contains, as well. 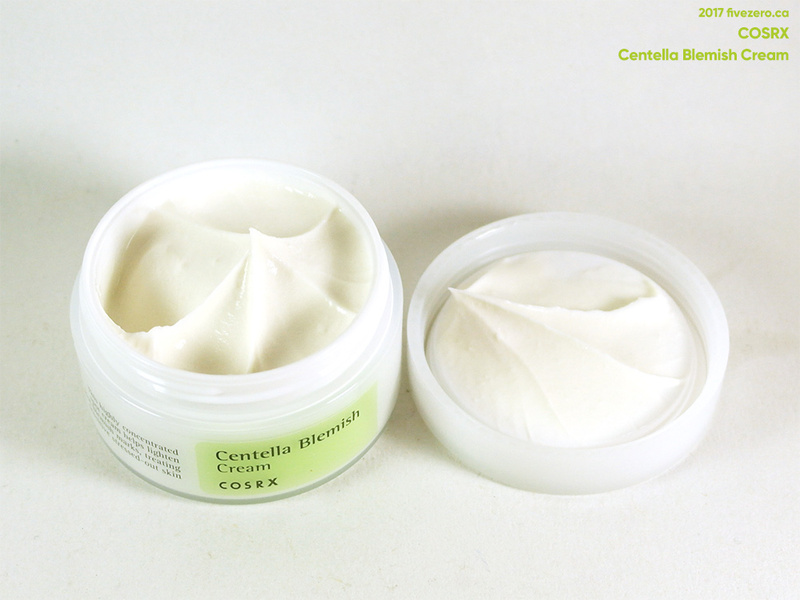 Centella Blemish Cream, by comparison, contains other ingredients meant to be beneficial to the skin. The main ingredient is actually Centella asiatica leaf water, from a plant commonly known as the Asian or Indian pennywort, which is both eaten and used as a medicinal ingredient in South Asia. It also includes small amounts of tea tree oil and Scutellaria baicalensis root extract, from another Asian medicinal plant. I’m curious to try other Centella products, as I don’t really know how much of the product’s effectiveness is down to the Centella leaf water and Centella extract, and not just the zinc oxide. Personally, I am also a little bit sensitive to tea tree oil (I’m pretty sure it’s made me break out in the past), though it seems to be present in a small enough amount here, that it hasn’t bothered me. COSRX themselves have a line of other Centella products that don’t zinc oxide, and SCINIC has a Centella ampoule that I’m interested in trying, after being pleased with some of their other ampoule products. 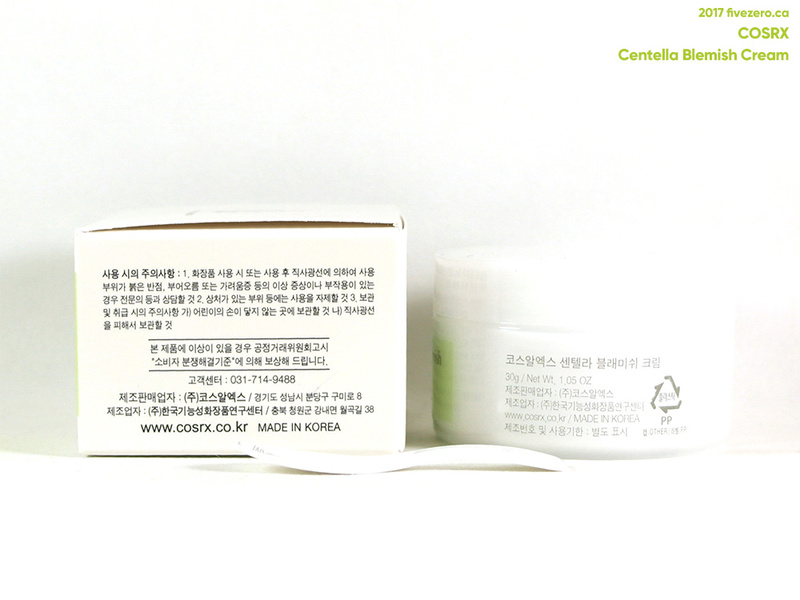 COSRX Centella Blemish Cream contains 30 g and retails for around US$19 online; I’ve found COSRX products to go on sale fairly often on Korean online stores. COSRX (Cosmetic + RX). From their website: “COSRX means efficacious cosmetics that are RX-ed with natural skin care components based on dermatology.” The company is based in Seoul, South Korea. I’m curious about this now! Zinc oxide is good stuff… I’m on the fence about tea tree too but I’ve had success with some products containing it (not high concentration). Tea tree oil has never worked for me, though perhaps it is not as effective for hormonal acne (that is/was my biggest struggle too). I have yet to try a zit cream that has really worked well, think I need to get a tub of this!